Sometimes the little guy gets a clear win. Last month, with support from our Environmental Dispute Resolution Fund, the Nicola Valley Fish and Game Club defeated the Douglas Lake Cattle Company – the largest private land owner in BC and one of the largest cattle companies in the world – in a fight to win back public access to two local lakes and to ensure that wild fish cannot be privatized. Since 1990 the Douglas Lake Cattle Company blocked access to Stoney Lake Road, a road that provided access to two lakes – Minnie Lake and Stoney Lake – situated on the Company’s large ranch near Merritt, BC. At one end of the road, the Company locked a gate to prevent the public from entering, and the other end was blockaded with rocks and logs. The local fish and game club was determined to regain public access to the lakes, and stepped up to take the ranch owner to court. In its long-awaited ruling, the Court concluded that the lakes were public, the road was public, and the fish in the lakes were public fish (although, of course, the Court did not consider the implications of unextinguished Aboriginal title in the area). 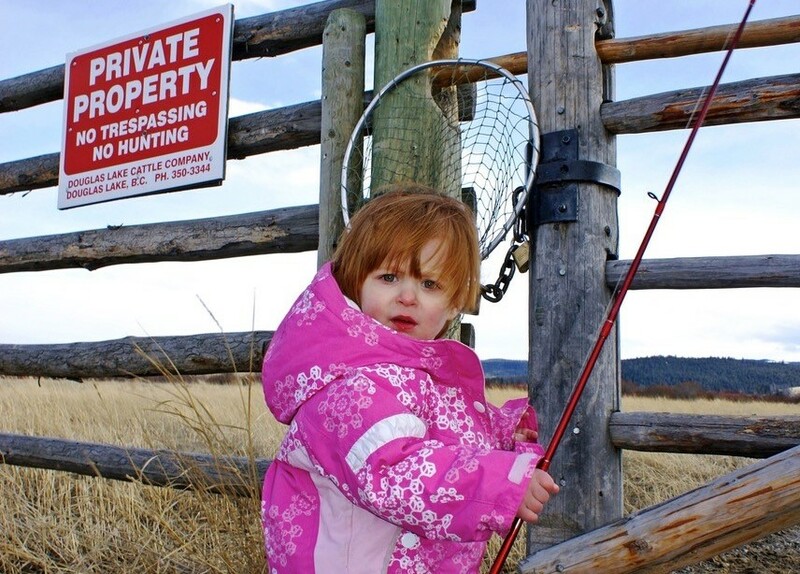 The Company had never had a right to exclude the public from those spaces or prevent them from catching those fish. This case has been well summarized in many recent media stories (see for example here, here, and here), as well as our earlier blog on the subject, so we’ll focus on highlighting the Court’s exceptionally strong statements protecting the public interest. I cannot help but conclude that DLCC’s actions in closing this road were the acts of a corporation with immense power and regional influence that simply felt it could do what it wanted to advance its interests, regardless of ownership, public rights and the public good. They were successful in this from the early 1990s until this litigation began [para 134]. It is shocking that any corporation could take for its own benefit, with no legal right, a road. This taking began with the locking of a gate. It was predicated on an alleged land swap for which there is no evidence. This was done to assist DLCC in the maintenance of its cattle operation, but it also seems clear that it was done for the express purpose of prohibiting access to two lakes, which DLCC determined they could modify and stock, in order to create a recreational fishing business. This, in spite of the fact that they did not own the lakes [para 221]. In the ruling, the Hon. Justice Groves noted that in his experience, most people would need a legitimate reason to request and receive private contact information from the RCMP. …if one made a criminal complaint, such as trespass, in the usual course of events, it would be highly unlikely that the RCMP would release this information to allow one to effect one’s own remedy. Yet, in Mr. Gardner’s experience, information was somehow obtained immediately. All of this is suggestive that there was a cozy relationship between Mr. Gardner and RCMP, or other authorities, who had in their possession licence information, and that these authorities were apparently willing to give this to Mr. Gardner promptly [para 215]. On the basis of this and other shady behaviour by a local Ministry of Highways employee [para 130], the Court further concluded that "the concerns raised about the inappropriate influence of Mr. Gardner and DLCC in the Merritt area have some foundation [para 216]." By 1996, a provincial government official had determined that the Company’s road blockade was illegal, but took no action to right this wrong. It is doubtful that any action would have been taken to restore public access to these lands and waters if not for this court case. As critical as I am of Mr. Gardner, greater criticism may be levelled at the Province for its absolute lack of action in maintaining their property and enforcing the public good against a determined and bullying corporate entity and its manager… [A] representative of the Province had determined in 1996, with some certainty, that the closure of the Stoney Lake Road was unlawful. Yet, the Province did not respond to this apparent unlawful act. In fact, for over 20 years, it did nothing. Over 20 years, a privately-held corporation, owning a large swath of land, prohibited the public from driving on a public road and the Province did nothing [para 307-311]. In my view, the Province has a public duty to maintain the ownership of public lands and roads and to prohibit those who, for their economic or personal benefit, choose to occupy public lands without licence, or interfere with public access to public roads [para 317]. …I am not pointing a finger at any particular government individual but, again, it is most unfortunate that all governments holding the obligation of the public trust have failed to take any actions to prohibit what was an illegal obstruction of a public road by a corporate entity, for its own benefit [para 327]. It’s hard not to draw comparisons between official reluctance to act against the Douglas Lake Cattle Company when it obstructed a road, and the official response when other people obstruct roads. The Company obstructed a road for over twenty years, and was treated with kid gloves by the Province and the RCMP. When the Upper Nicola Band staged a counter-blockade, the official response was quite different. And today, when the Wet’suwet’en people occupy a road within their own territory, we’ve seen what the official response looks like. The Fish and Game Club members were not the only people that the Douglas Lake Cattle Company prevented from accessing Minnie and Stoney Lake. The Upper Nicola Band was also told that its members could no longer access the lakes, which are part of the Nation’s territory. The Upper Nicola Band had fished the two lakes for hundreds of years (at least) and had never ceded or surrendered their territory. On top of that, the Upper Nicola Band had a written guarantee from the federal agent who came through in 1878 that its members could continue to fish the lakes. The Company’s actions to exclude the Upper Nicola Band from using the lakes led to a series of confrontations between the Douglas Lake Cattle Company and the Upper Nicola Band that resolved in 1995, with Band members regaining access to the lakes. Issues of Indigenous jurisdiction and Aboriginal rights and title were not before the Court in this case, but they are important to think about in any case that deals with access to lands and waters. What do the Indigenous laws of the region have to say about water, who can access it, and under what circumstances? What would this litigation have looked like if it had been able to reference the Indigenous laws of the region? [I]f you own the lakes of the province, which you do, can you not regulate access? ... [C]onsider doing what other jurisdictions have done and guarantee access to this precious public resource. This case is a big win for a small group of citizens against a very powerful corporation. The Douglas Lake Cattle Company thought it could prevent the public from accessing public waters and a public road, and for over twenty years it succeeded. But this court victory sets a clear and powerful precedent: a private company cannot block access to public roads and waters. In BC, where a surprising number of lakes and public roads are locked away behind private gates, it will be interesting to see how this precedent plays out. UPDATE: This blog was originally posted with a photo depicting a person ice fishing on one of the public lakes at issue in the case. The photo was taken several years ago and showed a small number of dead fish on the ice. The December 2018 court judgement – which confirmed Douglas Lake Cattle Company had illegally blockaded a public road and restricted access – also declared that going forward, any fishing in the lakes by non-Aboriginal fishers should be on a catch and release basis (at least until the Province or a court orders otherwise). Although the photo was taken before the catch and release order was issued, we have replaced the image in order to avoid confusion.